History can literally be changed, you just have to go back to that specific point in time to change it. In Timeline, anthropology professor Edward Johnston (Billy Connolly) leads his students on an archaeological dig study in the ruins of Castlegard, a village in France that was one of the battleground settings for the Hundred Years’ War. One of Professor Johnston’s students happens to be his son Chris (Paul Walker), who has taken a strong but semi-unrequited liking to his classmate Kate (Frances O’Connor). The team begins to receive and discover some oddly dated objects, which prompts Professor Johnston to fly to the ITC Corporation in New Mexico, the corporation that is sponsoring the dig. After a few days of not hearing any word from him, Chris and classmates are asked to the company’s headquarters, where they find out the truth about Edward. By way of a wormhole, Professor Johnston is now in the year 1357. To rescue him, it is simple. Chris and friends must go into the past to bring the professor back in order to preserve the present and future. For a director who has done many films that can, in a way, be considered as crown jewels in their respective genres (Superman 1978, The Omen, The Goonies, even Lethal Weapon), it is shocking that Richard Donner is the man behind Timeline, a massive dud on mostly all fronts. It is not much better than a straight-to-video effort, compounded by the fact that it cost roughly 80 million to make. 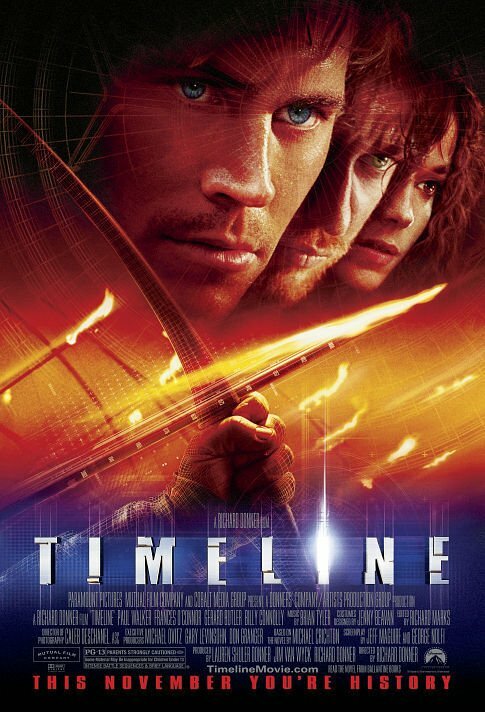 Timeline is an adaptation of the novel with the same name authored by Michael Crichton, the man who is credited with creating the television show ER as well as the massive franchise in Jurassic Park starting with the novel. The novel may be fine, but what transpires on the screen is the furthest thing from it. 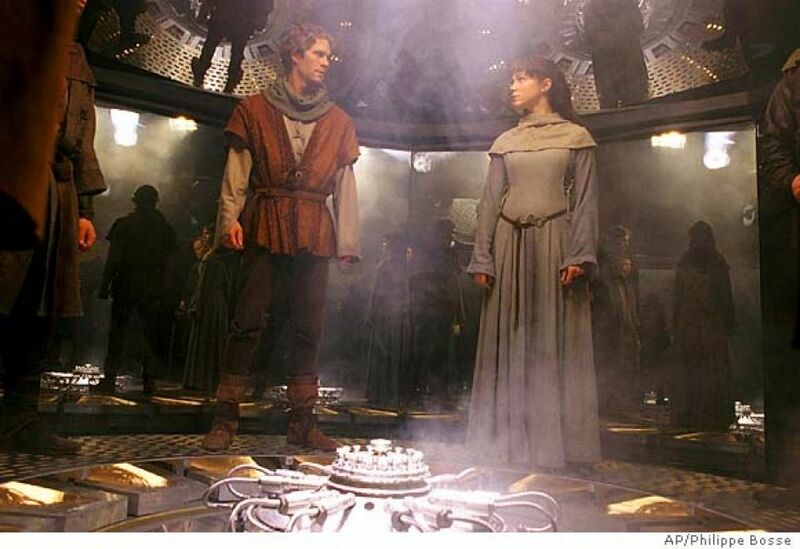 It fails to interest, doesn’t really know if it is a science fiction or a medieval fantasy, and has no real idea of pacing or development of its characters. In essence, the film is a series of love stories between father and son, young men and young women, and it is expected that these relationships will give the film the emotional core it needs, but with so little effort put into them, it is tough to care about whether they come to fruition or not. With the stinker of the plot, it is here where one can see the creative differences that occurred between Donner and the studio. About the only aspect that does work—mildly—happens to the design, though for the money tied into this, it leaves something to be desired as well. Sadly, these problems are only exacerbated by downright putrid performances. Lead billing goes to Paul Walker. Walker always possesses the super California cool, likable, and magnetic personality, traits that were great positives to most of his movies. But here, as an archaeological student, he is woefully miscast. Even in 14th century garb, it is impossible not to see Brian O’Conner in this, as his delivery is basically what is seen and heard in that franchise, and he doesn’t appear to be trying to do anything else. Yours truly halfway expected to see his character ride out in the iconic Skyline or Toyota Supra. Romantically, he has zero chemistry with the woman who plays his love interest, Frances O’Connor, who is so dull and lifeless here. Really, that can be said for just about everyone that appears here, including Neal McDonough, Anna Friel, and Martin Csokas to name a few. Only Gerard Butler as a archaeologist is the positive from the acting sense. He has next to nothing to work with, but his character is written the strongest (by default) , and Butler seems to get into it more than the others. When the writer of the novel decides to disassociate themselves from their film adaptation to the point that they would be fine in never selling any text rights to a studio again, the studio must have created a deplorable film. This is a hard timeline to follow. Photo credits go to imdb.com. people.com, and galleryhip.com. Yeah, pretty much a disappointment on all fronts. I checked it out for its time travelling elements, but even those aren’t much to write home about. Yes, a mess, from casting to script to directing. Missed this when I was 13, probably should have remained that way haha. Aw, crap, I have this one to watch tonight!